iVascular announces the launch of its range of drug-eluting balloons (Drug Eluting Balloon , DEB) with immediate worldwide availability. luminor 14 is a balloon catheter compatible with 0.014” guide wire, with coaxial design (OTW), suitable for widening or opening stenosis of femoral, popliteal and infrapopliteal; and is presented with a working catheter length of 100 and 150 cm, balloon diameter between 1.5 and 4 mm and balloon lengths from 40 to 200 mm. 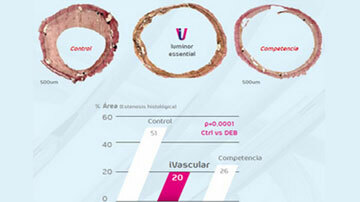 iVascular has developed its own coating technology known as TransferTech whereby an homogeneous and precise nano-deposition of microcrystalline paclitaxel is achieved, which yields a fast and quantitative drug transfer to the arterial wall and a high residence time of the drug in the focus of injury. Thanks to Transfertech, a multilayer and ultrathin coating is deposited which provides greater adherence to the balloon so that drug stability is guaranteed and the detachment of particles is avoided during navigation. The design of iVascular catheters, widely proven in oceanus 14, oceanus 35 and xperience bare balloon catheters, endorses the new DEB range with very high proximal pushability and progressive distal flexibility, plus the best deflation rates existing in the market. Furthermore, the use of low profile, conical, non-traumatical tips ensures superb crossability. Preclinical data on swine model (N = 51) with histological and angiographic follow-up at 28 days, demonstrate that iVascular DEBs provide lower restenosis than bare balloons and even up to 23% improved benefits compared to other DEBs available in the market, ensuring safety and efficacy.